Fire Prevention Week was October 9-15th. 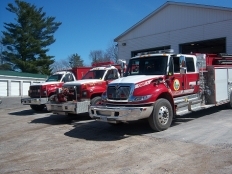 Our Fire Prevention Officer, Sean Porter, reports that many classes had tours of the fire hall as well as the department making visits to both Tweed schools. The classroom visits were a big hit with the students and they were excited to receive fire safety promotional materials and have Sparky the fire dog stop by. The younger students enjoyed a new Timon & Pumba safety video while the older students received videos for their class rooms on fire prevention safety. On a final note with our Tweed Fire Department, they are excited to see the arrival of the new pumper tanker. With the aid of this new truck it will help make it a lot easier for the department to put out fires and protect our community! To check burning conditions or other information, including children’s games, please visit our new website at www.tweedfire.ca.